iOS 5 added a few new features to email on the iPad. While none of the new features are groundbreaking we will cover the additions that were made to improve email on the tablet. iOS users now have the ability to use bold, italic or underline fonts. You can also create indents in your messages by selecting text, tapping the arrow above the selected text and tapping quote level. You can then increase or decrease the indention. You can use bold, italics and underline by the same method of selecting the text and tapping the arrow then selecting BIU. You can now flag important messages by taping Edit from your inbox and selecting Mark at the bottom of the screen. This can be helpful finding and remembering not to delete important messages. There are some improvements to the keyboard that are also beneficial in typing emails. You can now create shortcuts for commonly used phrases. Apple�s example is omw, On my way! If you type omw, �On my way!� is automatically inserted. You can enter any phase or sentences you want with any shortcut. To add shortcuts; go to Settings-> General-> Add New Shortcut. iOS 5 now gives you the option to split and move your keyboard. 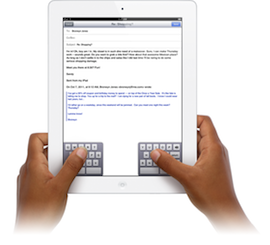 This lets the iPad user adjust the keyboard to a position that is most comfortable for them to type. To Split the keyboard; hold the bottom right key on the keyboard until the option to Split and Undock pops up. Undocking the keyboard will leave as the keyboard normally looks but you can move it up and down the screen by hold the bottom right key and moving your finger up and down the screen. The split keyboard can also be moved by holding the bottom right key and sliding your finger. With iCloud and iOS 5, iPad and iPhone users can create folders using their free me.com account that comes with iCloud. The folders can be added and removed from your iOS device or by going to iCloud.com. 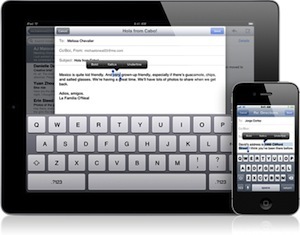 Visit this page for more information on how to create email folders on your iPad. Unfortunately, Apple has not added colored text, different fonts and increasing the size of the font when creating emails on the iPad. However, here is a free app that will allow you to do all of those things.